The second course is the DARLING COURSE, which is a STANDARD COURSE modified with the addition of two DARLING MARKS which must be left to PORT. This is named in honor of John Darling who was the resident race committee and race starter in the New Jersey area throughout the 1970’s and 1980’s. Mr. 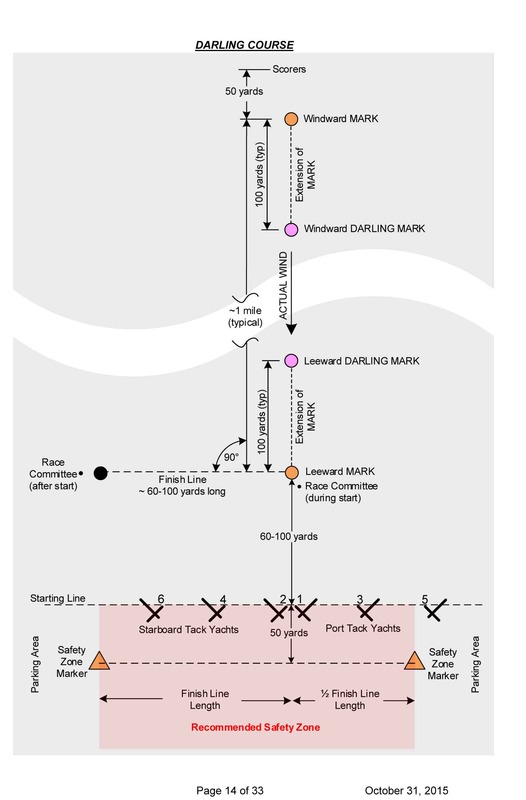 Darling was the first to use the DARLING MARK at the leeward end of the course. The DARLING MARK serves several purposes:. A. In larger fleets, there can be a tendency for some of the even side starters on STARBOARD TACK to over stand the windward MARK. When they tack over to PORT TACK, they are set up for a head on collision with yachts that have already rounded the windward MARK. Therefore, near the windward MARK, the DARLING MARK creates separation between ON-THE-WIND PORT TACK yachts and OFF-THE-WIND STARBOARD TACK yachts to minimize collisions. B. After rounding the windward MARK, some yachts may desire to JIBE as soon as possible. This can create head-on collision situations with STARBOARD TACK ONTHE-WIND yachts that have understood the windward MARK. Therefore, near the windward MARK, the DARLING MARK creates separation between ON-THE-WIND STARBOARD TACK yachts and OFF-THE-WIND PORT TACK yachts to minimize collisions. C. Creates separation between a PORT TACK ON-THE-WIND yacht that has just rounded the leeward MARK and STARBOARD TACK OFF-THE-WIND yachts approaching the leeward MARK. D. Creates separation between a STARBOARD TACK ON-THE-WIND yacht that has just rounded the leeward MARK and subsequently TACKED and a PORT TACK OFF-THEWIND yacht approaching the leeward MARK. In larger fleets, there can be a tendency for some of the even side starters on STARBOARD TACK to over stand the windward MARK. When they tack over to PORT TACK, they are set up for a head on collision with yachts that have already rounded the windward MARK. Therefore, near the windward MARK, the DARLING MARK creates separation between ON-THE-WIND PORT TACK yachts and OFF-THE-WIND STARBOARD TACK yachts to minimize collisions. After rounding the windward MARK, some yachts may desire to JIBE as soon as possible. This can create head-on collision situations with STARBOARD TACK ONTHE-WIND yachts that have understood the windward MARK. Therefore, near the windward MARK, the DARLING MARK creates separation between ON-THE-WIND STARBOARD TACK yachts and OFF-THE-WIND PORT TACK yachts to minimize collisions. Creates separation between a PORT TACK ON-THE-WIND yacht that has just rounded the leeward MARK and STARBOARD TACK OFF-THE-WIND yachts approaching the leeward MARK.